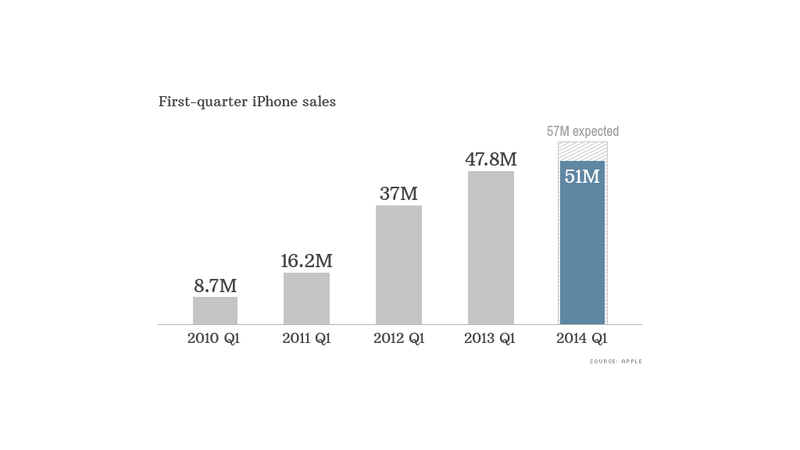 Apple posted record iPhone sales, but they were still far weaker than analysts' expectations. Apple sold a record number of iPhones in the last three months of 2013, but the company's stock tumbled as investors were expecting a significantly larger haul. The tech giant sold 51 million iPhones during the quarter, up from 47.8 million a year earlier. But Wall Street analysts were expecting closer to 57 million iPhones, after Apple launched its new iPhone 5S and 5C smartphones in China simultaneously with the United States and Western Europe for the first time this fall. But China wasn't the problem. Chinese sales soared 29%, even though Apple hadn't yet inked its landmark deal to sell iPhones and iPads to customers of China Mobile (CHL), by far the world's largest wireless carrier. The impact of the China Mobile deal is expected to deliver a huge boost to Apple's overall numbers in the coming year. North American sales actually fell 1% year-over-year. On a conference call with investors, Apple CEO Tim Cook said cell phone companies' longer upgrade cycles were partially to blame for weak American sales. He also noted that orders for the iPhone 5S were stronger than expected, so it took some time for Apple to make enough of the smartphones to meet customer demand. Apple's outlook also disappointed. The company said it expects to bring in sales between $42 billion and $44 billion in the current quarter, far lower than the $46 billion analysts had forecast. As a result, Apple (AAPL) shares fell 7% Tuesday. Tim Cook was predictably cagey about any future product plans, but confirmed that the company was still working on new product categories for the end of 2014. That could mean anything from wearables to a full TV. Mobile payments is a category ripe for Apple, especially with the addition of the Touch ID fingerprint sensor to the iPhone 5S. Cook would not confirm any plans for mobile payments but noted a large amount of commerce already goes through the iOS platform and that customers have embraced using Touch ID to purchase content from the App Store and iTunes. While Apple has been going strong on its existing categories for years. Some investors don't think smartphone and tablet sales alone can sustain such high levels of growth and are hungry for something new. It wasn't all bad news for Apple. The company sold 4.8 million Macs, up 17% from a year earlier. And Apple sold a record 26 million iPads during the quarter. And the company's profit came in far better than expected. Apple reported fiscal first-quarter earnings of $13.1 billion or $14.50 per share, essentially even with a year ago. Analysts polled by Thomson Reuters expected earnings of $14.07 per share. Sales rose 6% to $57.6 billion. That just edged out the $57.5 billion in revenue that analysts had expected.